19th century lithograph of William Price. 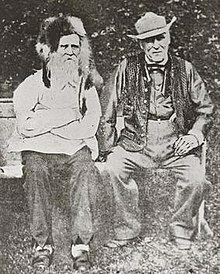 William Price (4 March 1800 – 23 January 1893) was a Welsh physician known for his support of Welsh nationalism, Chartism and his involvement with the Neo-Druidic religious movement. He has been recognised as one of the most significant figures of 19th-century Wales, and one of the most unusual inVictorian Britain. Born to a lower-class household in Monmouthshire, Wales, he trained as a doctor in London, England before returning to Wales, becoming interested in the Chartists’ socialist ideas regarding equal democratic rights for all men. Following their failed 1839 uprising, he escaped government persecution by fleeing to France, where he became convinced that an ancient prophecy predicted that he would liberate his country from English rule. Returning to Wales, he tried reviving what he believed to be the religion of the ancient druids, the “Celtic” Iron Age ritual specialists of western Europe. In doing so, he became one of the most prominent proponents of the Neo-Druidic movement, something that had been developing since the Welsh nationalistIolo Morganwg‘s activities in the late 18th century. After cremating his dead son in 1884, Price was arrested and put on trial by those who believed cremation was illegal in Britain; however, he successfully argued that there was no legislation that specifically outlawed it, which paved the way for theCremation Act of 1902. Upon his death, he was cremated in a ceremony watched by 20,000 onlookers. William Price was born in a cottage at Ty’n-y-coedcae Farm (“The House in the Wooded Field”) in Risca, Monmouthshire on 4 March 1800. His father, also named William Price (1761–), was an ordained priest in the Church of England who had studied at Jesus College, Oxford, while his mother, Mary Edmunds (1767–1844), was an uneducated Welshwoman who had been a maidservant prior to her marriage. Their marital union was controversial because Mary was of a lower social standing than William, something which was socially taboo in late 18th century British society. The couple had three surviving children, Elisabeth (1793–1872), Mary (1797–1869) and Ann (1804–1878), prior to William’s birth. Reverend Price suffered from an undiagnosed mental illness, acting erratically and experiencing fits of violent rage. He bathed either fully clothed or naked in local ponds, and collected snakes in his pockets for days at a time. Carrying a saw around, he removed bark from trees, then burning it while muttering certain words, also spitting onto stones, believing that it improved their value. His actions led to him becoming a threat to the local community, in one instance firing a gun at a woman whom he claimed was taking sticks from his hedgerow, and in another hurling a sharp implement at another man. At home, Welsh was William’s primary language, but he learned to speak English at school, which was located two miles from his home, in Machen. Although only staying at school for three years, between the ages of 10 and 13, he passed most exams and proved himself a successful student. After spending six months living at home, he decided to become a doctor despite his father’s insistence that he become a solicitor. Travelling to Caerphilly in south Wales, in 1814 he became apprenticed to successful surgeon Evan Edwards, and paid for his tuition with money supplied by various family members. One of these benefactors, his uncle the Reverend Thomas Price of Merriott, Somerset, advised him to give up this education, arguing that it was putting too great a financial strain upon Price’s family, but William was insistent that he should continue. In 1820, his apprenticeship with Dr Edwards came to an end, and despite his lack of funds, he decided to move to London in order to continue his studies. Here he took up lodgings near to St Paul’s Cathedral, and entered The London Hospital in Whitechapel for a year of instruction under Sir William Blizard. Around the same time, he also registered at St Bartholomew’s Hospital, where he was under the instruction of surgeon John Abernethy. Gaining employment caring for wealthy clients to help financially support his studies, Price eventually became a member of the Royal College of Surgeons, being awarded with a certificate signed by Blizard, Abernathy and others. Contemplating travelling to India following the culmination of his studies in London, he instead decided to return to Wales, where he would work as a general practitioner. Becoming a trained doctor, Price returned to his homeland of Wales, initially setting up in his practice in his home district, before later moving to the newly industrialised Taff Valley near to Pontypridd. It was here that he was elected by the workforce to be the surgeon of the main chain-making plant in Pontypridd in 1823. Being a proud Welsh nationalist, Price became friends with a wealthy family, the Guests, who held similar views, and gave a speech on Welsh history and literature at their Royal Eisteddfod in 1834, which Lady Charlotte Guest felt to be “one of the most beautiful and eloquent speeches that was ever heard”. On the basis of it, he was invited to take up the job of judging the eisteddfod’s bardic competition, with the prize being awarded to Taliesin, the son of the famous Welsh nationalist and Druid, Iolo Morganwg. Meanwhile, his social conscience had led him to become a significant figure in the local Chartist movement, which was then spreading about the country, supporting the idea that all men should have the right to vote, irrespective of their wealth or social standing. Many of the Chartists in the industrial areas of southern Wales took up arms in order to ready themselves for revolution against the government, and Price himself aided them in gaining such weaponry, and according to government reports, by 1839 he had seven pieces of field artillery. 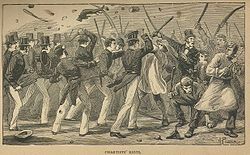 That same year, the Newport Rising took place, when many of the Chartists and their working class supporters rose up against the authorities, only to be quashed by soldiers, who killed a number of the revolutionaries. Price himself had recognised that this would happen, and he and his supporters had not joined in with the rebellion on that day. Nonetheless, he also realised that the government would begin a crackdown of those involved in the Chartist movement in retaliation for the uprising, and so he fled toFrance, disguised as a woman. It was whilst in temporary exile as a political dissident in Paris, France that he visited the Louvre museum, where he experienced what has been described as “a turning-point in his religious life.” He became highly interested in a stone with a Greek inscription that he erroneously felt depicted an ancient Celtic bard addressing the moon. He subsequently interpreted the inscription as a prophecy given by an ancient Welsh prince named Alun, declaring that a man would come in the future to reveal the true secrets of the Welsh language and to liberate the Welsh people: as historian Ronald Hutton later remarked however, “nobody else had heard of this person, or made (anything like) the same interpretation of the inscription”. Nonetheless, Price felt that this prophecy applied to him, and that he must return to Wales to free his people from the English-dominated authorities. A photograph of Price taken whilst he was on stage in 1884. This displays some of his Druidical attire. Soon returning to Wales, he set himself up as a Druid, founding a religious Druidic group that attracted a number of followers. Little is known of the specific doctrines which he preached, but his followers walked around carrying staffs engraved with figures and letters. Declaring that marriage was wrong as it enslaved women, he began having a relationship with a woman named Ann Morgan, whom he moved in with, and in 1842 she bore him a daughter. He baptised this child himself at the Rocking Stone in Pontypridd, naming her Gwenhiolan Iarlles Morganwg (meaning ‘Gwenhiolan, Countess of Glamorgan‘). He began developing an appearance that was unconventional at the time, for instance wearing a fox fur hat and emerald green clothing, as well as growing his beard long and not cutting his hair. He also began attempting to hold Druidic events, organising an eisteddfod at Pontypridd in 1844, but nobody turned up, and so, solitarily, he initiated his daughter as a bard at the event. In 1855 he then led a parade of the Ivorites, a friendly society that held to a philosophy of Welsh nationalism, through the streets of Merthyr Tydfil, accompanied by a half-naked man calling himself Myrddin (the Welsh name for Merlin) and a goat. In 1866 he returned to Wales, finding that his daughter had grown up to live her own life following her mother, Ann Morgan’s death. He settled to live in the town ofLlantrisant, where he opened up a new medical practice, which proved to be a success, and he took a young farmer’s daughter, Gwenllian Llewelyn, who at the time was only twenty-one years old, to be his new partner, despite the fact that he was an old man by this time. Despite his earlier pronouncements against marriage, he organised a Druidic wedding ceremony through which he married Gwellian on 4 March 1881. Taking place at the Rocking Stone in Pontypridd, it involved Price addressing the sun at noon, and women dressed as the Three Graces were involved. The ceremony attracted a large audience, who according to reports found the whole proceeding amusing. Meanwhile, in 1871, he had published a book, written in his own invented form of Welsh that he believed was the true language of the ancient Welsh. In the work, which had a title that translated as The Will of My Father, Price conceptualised the universe being created out of a snake’s egg by a supreme Father God. However, this work was largely ignored at the time and soon fell into obscurity. Gwellian and Price’s first child was born in 1883, a son whom Price named Iesu Grist (the Welsh for Jesus Christ), in an act of provocation against the traditional religion of the time, and also because he expected great things from his child. However, the infant died only five months later, in January 1884. Believing that it was wrong to bury a corpse, thereby polluting the earth, Price decided to cremate his son’s body, an act which at the time was taboo, although across the country there were already several proponents of it as a form of corpse disposal. He performed the funeral in the early evening of Sunday 13 January 1884, upon the summit of a hill to one side of Llantrisant. A number of local people noticed the fire, and upon discovering that Price was attempting to burn his infant son, surged on him. He was rescued from an angry mob by the police, who arrested him for what they believed was the illegal disposal of a corpse, and the body of his son, which had not yet been engulfed by the flames, was removed from the pyre. Price with his friend, Robert Anderson, who would later light Price’s funeral pyre. An autopsy was performed on Iesu’s body by a local doctor, who concluded that the child had died of natural causes and had not been murdered. Price was therefore not charged with infanticide, but was instead tried in a Cardiff courtroom for performing cremation rather than burial, which the police believed to be illegal. Price argued that while the law did not state that cremation was legal, it also did not state that it was illegal. The judge, Mr. Justice Stephen, agreed. Price was freed, and returned to Llantrisant to find a crowd of supporters cheering for his victory. On 14 March, he was finally able to give his son a cremation involving his own personal Druidic prayers. The case set a precedent which, together with the activities of the newly founded Cremation Society of Great Britain, led to the Cremation Act of 1902.In 1885 the first official cremation took place at Woking, and ten cremations are recorded as being performed in the following year. In 1892 a crematorium opened inManchester, followed by one in Glasgow in 1895 and one in Liverpool in 1896. The media interest in the court case had made Price famous, and he soon began to capitalise on this fame, selling three hundred medals, each depicting the cosmic egg and the snake that laid it, commemorating his victory, which sold at three pence each. He began to be invited to give lectures and attend public functions, but these did not prove to be particular successes, with much of his audiences not understanding either his philosophies, or his attire, which was made out of red cloth and embroidered with green letters. In late 1884, his wife gave birth to their second child, whom Price also named Iesu Grist, and in 1886 she then bore him a daughter, whom they named Penelopen.He believed that his son had an important future ahead of him, being the prophesised second coming of Jesus Christ, his namesake, and predicted that he would come to reign over the earth. Meanwhile, in 1892 he erected a pole which was over sixty feet high, with a crescent moon symbol at its peak, atop the hill where his first son had been cremated, and noted that he wanted his funeral to take place there as well. Price died on the night of 23 January 1893. His final words, when he knew that he was near death, were “Bring me a glass of Champagne“. He drank the champagne and died shortly after. On 31 January 1893, William Price was cremated on a pyre of two tons of coal, in accordance with his will, on the same hillside overlooking Llantrisant. It was watched by 20,000 people, and overseen by his family, who were dressed in a mix of traditional Welsh and his own Druidic clothing. His wife would go on to remarry, this time to a road inspector employed by the local council, and she gave up her Druidic beliefs to join a conventional Christian denomination, having her two children baptised into it, and Iesu Grist was renamed Nicholas, never fulfilling the ambitious predictions that his father had made about him. Oil painting of Price by A.C. Hemming, 1918. On display at theWellcome Collection in London. Price held several strongly held beliefs that were counter-cultural to the Victorian social norms of the time, and chose to promote them in a “most exhibitory fashion”. During his life, Price’s list of behaviour and characteristics included being a fanatical walker and a strong supporter of conservation, wearing a fox-skin headdress, never wearing socks (which, he thought, were unhygienic), refusing to treat patients who were smokers and washing every coin he received as he considered them a major source of cross-contamination. He was also a vegetarian, saying that eating meat “brought out the beast in man”. Price did not believe in marriage, which he saw as theenslavement of women and also disliked the capitalist coal mine owners and the all-powerful local gentry. He was also a supporter of the local miners in several strikes during the 19th century. His religious beliefs have provided an influence on the modern druidic movement. Michell referred to him as “a natural shaman”. Statue of Dr William Price in the Bull Ring, Llantrisant. Soon after his death, ballads commemorating him were composed and circled the local area for a number of years to come. In 1896, an exhibition that commemorated his life was held in Cardiff, whilst a pamphlet biography of him was published to accompany it. In 1940, a more significant biography about Price was published, entitled A Welsh Heretic, which was written by Islwyn Nicholas. In 1947, the Cremation Society put up a plaque commemorating him in the town of Llantrisant, whilst a statue of him was unveiled in the town in 1982, depicting the doctor in his characteristic fox-skin headdress, arms outstretched. This was followed in 1992 when a memorial garden was named after him, and an exhibition about him opened in the town’s visitor centre. In a 1966 book examining the history of Llantrisant, author Dillwyn Lewis described Price as being “one of the most controversial figures of modern times.” The historian Ronald Hutton would later describe him as “both one of the most colourful characters in Welsh history, and one of the most remarkable in Victorian Britain“whilst his biographer Dean Powell considered him “the most notable individual in 19th century Wales”. ^ a b c Powell 2005. p. 03. ^ a b c d Hutton 2009. p. 253. ^ Powell 2005. p. 06. ^ Powell 2005. pp. 09-10. ^ Powell 2005. p. 09. ^ Powell 2005. pp. 10-11. ^ Powell 2005. p. 12. ^ Powell 2005. p. 13. ^ Powell 2005. pp. 15-17. ^ Powell 2005. p. 26. ^ Hutton 2009. pp. 253-254. ^ Hutton 2009. p. 254. ^ Hutton 2009. pp. 254-255. ^ a b Hutton 2009. p. 255. ^ Hutton 2009. p. 256. ^ Hutton 2009. pp. 280-281. ^ Hutton 2009. pp. 281-282. ^ Hutton 2009. pp. 283-284. ^ Michell 1997. p. 06. Michell, John (1984). Eccentric Lives and Peculiar Notions. London: Thames and Hudson. ISBN 0-7474-0353-8. This page was last modified on 6 April 2013 at 23:53.